Jim and Teresa White know how to raise heifers. They just won the National Heifer Rearing Competitionhere in Ireland. 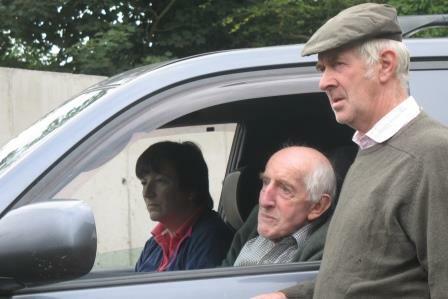 There was a farm walk at their farm in County Tipperary on the 10th of September. What is unusual about the White’s farm is not that they weigh calves and heifers 4 or 5 times per year. What is unusual is that then they do something about it! They remove the quarter of the animals that are the smallest and put them into their own group. 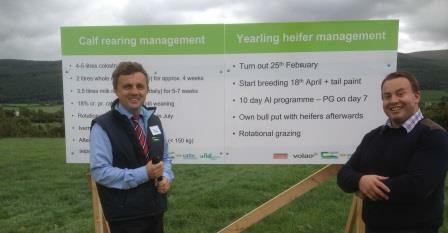 These heifers get special treatment: extra feed and the freshest paddocks. 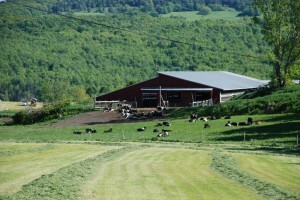 Jim and his wife have a milking herd of 106 cows, mostly Friesian, with some Jersey crosses. They produce spring milk, so their herd is dried off for about 6 weeks, starting in December. One of their big goals is ‘compact calving.’ They are able to have 78% of their herd freshen within 6 weeks, starting on January 14. In order to do this, they must really concentrate on breeding cows within a short period of time. Cows that do not fit the calendar are culled. (These might be great cows for someone else’s dairy herd). They also select bulls with shorter gestation periods. Calves get a good start: they are offered 3 quarts of colostrum within the first hour of birth, the first half hour is their goal, and the calves usually drink 2 quarts or a little more. Then Jim and Teresa continue to take top care of them. Calves are weaned when they are double their birth weight. The goal is to have the heifers at 60% of their mature weight by 13-14 months to begin breeding so they freshen at 24 months of age. The Whites have an interesting system. They are milking 106 cows now. But 139 cows and heifers calved this spring and they had 141 calves born. There were 56 heifers and 58 calves on the farm on the day of the farm walk. All male calves are sold at about 2 weeks of age, and fresh cows that might not quite fit his breeding program or that have some kind of a problem are culled. Their goal is to be milking about 150 in 2015, and then raise just enough calves to keep the herd size stable. 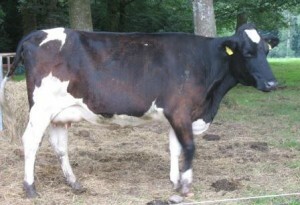 They focus on keeping the earliest born calves, with the best genetics, that come from easy-breeding cows for the herd. And because they have a good herd, other dairy farmers are quite interested in buying dairy cattle from this farm. The Whites attention to detail and is what earned them the Heifer Rearing award. Feeding colostrum, a vaccination plan, weighing heifers to sort and group them, keeping heifers growing, breeding them to freshen at 24 months, and compact breeding and calving were the main points stressed at the farm walk. The last ‘stand’ at the farm walk was an opportunity to talk about fodder (forage) budgeting with farmers. 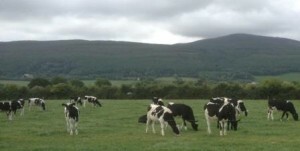 According to a survey done in early September by Teagasc, about 20% of the farms in Ireland are short of hay or silage. Results further showed the country to be about 8% short. 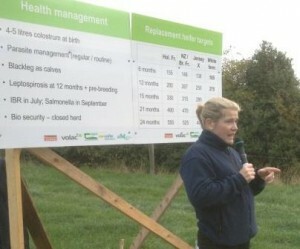 Teagasc advisors are recommending that farmers count and measure their forage supplies. Then calculate how many head are on the farm now, and are likely to be on the farm come spring. Farmers surveyed were counting on 140 day barn-feeding period, which seems like a bit of wishful thinking, as 150 days might be more like it (in Vermont it is more like 200 days). No matter how long the winter might be, the point is to do some figuring now in order to do some buying of feed or selling of animals. There is a good supply of straw from the wheat and barley crops that can be fed with haylage in a ration for tail enders and dry cows, in order to stretch the home-grown forage supply. What are the key questions that reveal the strengths and weaknesses of a dairy business? The UVM Extension Farm Viability team regularly meets farm managers for the first time with the goal of asking the right questions that will enable everyone to reflect on the business. We have just posted the Dairy SWOT Analysis Worksheet that we take out to the farm to guide the conversations. 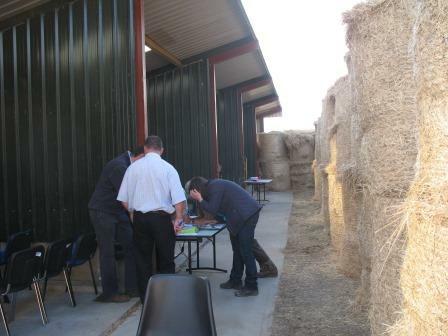 The same sheet can be completed by dairy managers who want to evaluate their business by themselves. This worksheet helps break the ice with basic farm questions while making sure you catch the details of feed, facilities, services and personality that impact the business. 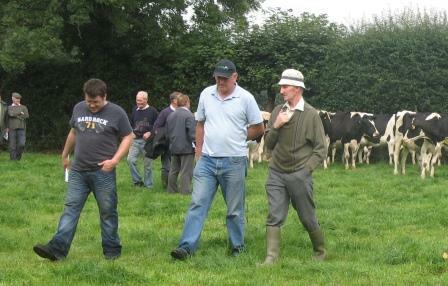 Last week I attended the Dairy Business Expansion Conference near Kilkenny. I thought it was great! About 175 farmers, all clients, attended this Teagasc day-long event. It was actually a test of the method and topics. 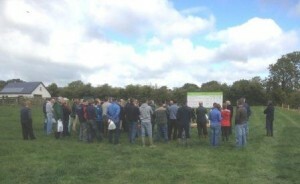 The week before, about 15 Teagasc dairy advisors (extension agents) met at the site with researchers to discuss how best to teach the topics on the day. One of Ireland’s stated goals is to expand milk production by 50% in the year 2020 over the 2007’s production. The European Union’s dairy marketing quota ends on April 1, 2015. Dairy farming, on average, is the most profitable type of farming in Ireland. So, many dairy farmers are looking to expand, and non-dairy farmers are thinking about getting started. The point of the Conference was to get farmers thinking about and working on the nuts and bolts of a possible expansion. The main topics for the day were: 1) Return on your investment; 2) Managing cash flow; and 3) Dealing with risk. Farmers were made up into groups of 15-10 people, and they stayed with their group for the day (which ran from 10 am to 3 pm). Last minute preparations in front of the shed with calf pens. Note hay bales used as sound-deadeners in front of shed, there is an identical shed to the right of the bales. The day began with a short welcome. 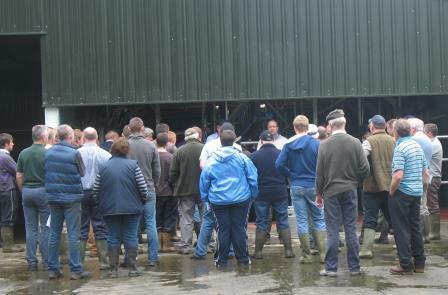 Farmer groups moved into the calf sheds for a 1-hour session: Return on Investment. There was plenty of discussion as farmers figured how much a given farm would need to invest for a certain expansion. We found plenty of places to invest: soil fertility and reseeding; water, fencing, and roadways for grazing infrastructure; milking facilities; wintering facilities and manure storage; and cows and heifers. Next: how much of your own money do you put in versus how much to borrow? Would your bank lend you this kind of money? Do you need to invest that much? Our group had a good discussion on how much overrun to plan on. Experience at the Greenfield Farm shows at least 10% is a good figure. 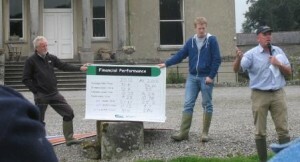 One farmer in our group said that any overrun shows poor budgeting and estimating! Then the groups worked on a partial budget to calculate potential profit from the additional cows, and compared that to the additional assets and equity put into the expansion to calculate a return on assets and return on investment. We were plenty busy for an hour! Farmers headed outside to look at cows and pasture and hear about how the Greenfield Farm is doing compared to their plan of 3 years ago: budget versus actual. Then back into the sheds for Cash Flow work. The groups estimated milk income, and several of the important costs. They used 1 year of actual figures and estimated for the next 5 years. They had to estimate principal and interest payments, add up the columns and look at the Bottom Line. Which years were negative? How much? What could be done to either fix that or live with it? Next- lunch! Then a look at how physical production of grass and cows are doing compared to the original plan, and in the very wet year last year and very dry summer of 2103. The last small group work was on Risk. Farmers brainstormed the risks involved with this expansion. Then picked 4 of the risks and thought about the likelihood of it happening, the impact of it happening, the cost if it happened, what the owner could do to minimize that risk or deal with the occurrence, how much would it cost to manage that risk, and what would be some early warning signs of a problem coming? Farmers left with the worksheets they had filled out during the day and blank worksheets to work with for their own farm. 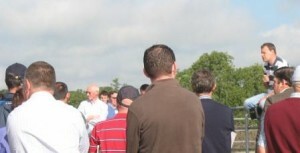 They were directed to where some of these tools are located on the Teagasc Client website. The conference was full, and there may be a second one. The dairy advisors who ran the small groups now have better skills to work with their clients who are considering an expansion. To me, the day was a big success: farmers were definitely discussing what capital improvements were needed, what they might cost, how to do it cheaper, talking about borrowing money, and really thinking about what risks an expanding dairy faces and what could be done about those risks. Last week I had the opportunity to attend a Monitor Farm Walk in County Wicklow. 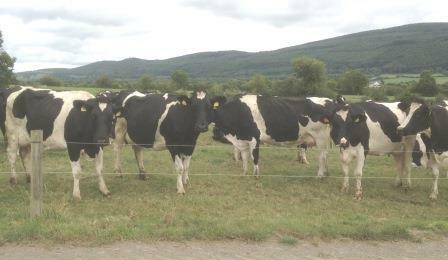 A Monitor Farm is a farm agrees to work closely with Teagasc and their milk coop, in this case Glanbia coop. A Teagasc Advisor works with the farmer to measure grass and cow productivity, soil testing, milk testing, and financials. The farmer agrees to make changes that will show the use of best practices, and to open the farm up for articles, newsletters and ‘walks.’ On 8/28, about 60 farmers visited Fortgranite Farm. 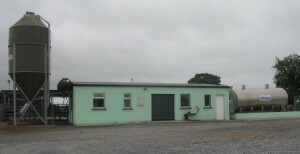 Pier Dennis owns the real estate of the farm, and is in an operating partnership with John Roche. They are milking 125 cows now, with the plan of getting up to 170 cows in 2015 (when the EU dairy marketing quota ends). Dairy farm partnerships are a pretty new idea here in Ireland. Dairying in Ireland is much different than in Vermont. Dairy marketing quota has been the limiting factor, putting a limit on the amount of milk that could be sold. So making milk as cheaply as possible has been the way to increase profits. This farm is planning on expanding by keeping all dairy heifer calves. They plan on shipping more fat and protein per cow from their breeding program (they are paid for this, not for volume, since most milk is turned into dairy products for export). The second stop for the day was grass growth. The farmers had a budget for the supply and demand of grass by week though the end of October. The plan includes how many cows would be on the grass, and amount they would be eating. As grass growth slows down in the fall, they have will be removing late lactation cows from the pastures and putting them into a free-stall barn and begin feeding them grass silage. The budget included how much grass they wanted left in the fields at the end of the season, because the grass continues to grow very very slowly during the winter, and the grass needs leaf surface area in the early spring to start growing again. The ground is not covered by snow for a couple of months here. The Gulf Stream usually hits Ireland head-on, making for a mild winter. Next stop, Soil Fertility. There was a soil test comparison report from 2008 and 2013. This report was set up so that you could see the % of fields testing high medium and low for pH, P, and K. It was very easy to notice that the pH of the soils had moved from nearly half below a pH of 6, to over 90% having a pH of over 6. Advisors said that this change in acidity ‘released a bag of urea per hectare per year.’ The news for P and K was just as obvious, but not as good. They had moved from no soil tests being deficient in P to over half being deficient. And K had moved in the same direction, but not so bad. Bulk Milk Disease Screening. A veterinarian with the Glanbia dairy cooperative spoke about tests that the coop conducts on milk samples from each member farm. They test for BVD, IBR, Lepto, Salmonella, plus stomach worms, liver fluke, and the Schmallenberg virus (that is relatively new in the country). The vet described what the readings on the tests meant, how the readings varied by season, the impact of the diseases, and what additional treatments or vaccinations this herd could be doing for these diseases. One question about Johnnes disease brought the response that they cannot test bulk milk samples for Johnnes, it is too dilute in samples from the bulk tank. There is a voluntary Johnnes program now in effect. Outside the new parlor, note: no exterior wall! The last stop was milk quality and the new milking parlor. The advisor pointed out the strengths and weaknesses of the new parlor. He made the suggestion that the best thing to do with hi cell count cows is to cull them, ‘give them to God.’ Or if you needed the milk, you could dry off the quarter. He gave high praise to the California Mastitis Test, the paddle with 4 test pits. Make sure that people were using gloves while milking to avoid spreading bacteria from cow to cow. And advised people to be aware of how hard their water was if they were mixing teat sprays, and when washing dairy equipment.